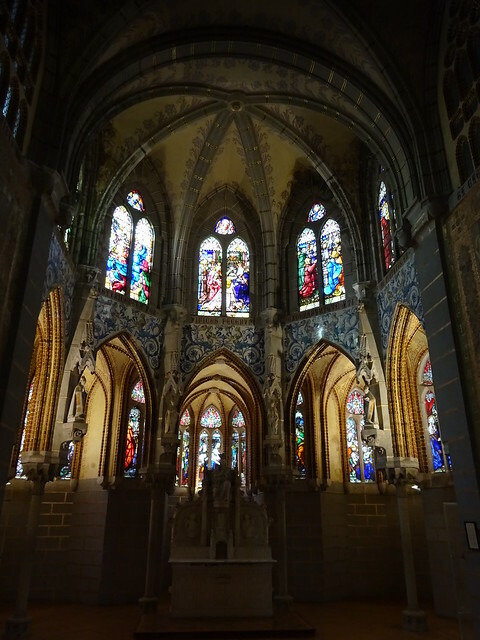 It isn’t an ordinary day when you can spend time at “The House of the Gods!” It is a little oasis before Astorga where you can help yourself to food and drink for free. You can drop a donation in a tin if you wish, but it isn’t necessary. 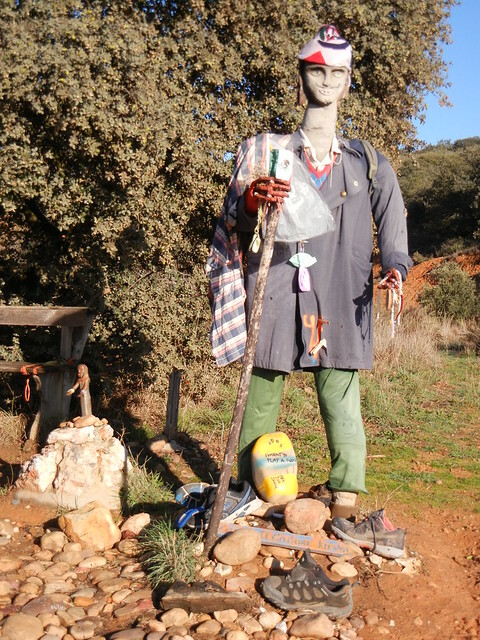 It is another thing on our Camino bucket list that was checked off today. 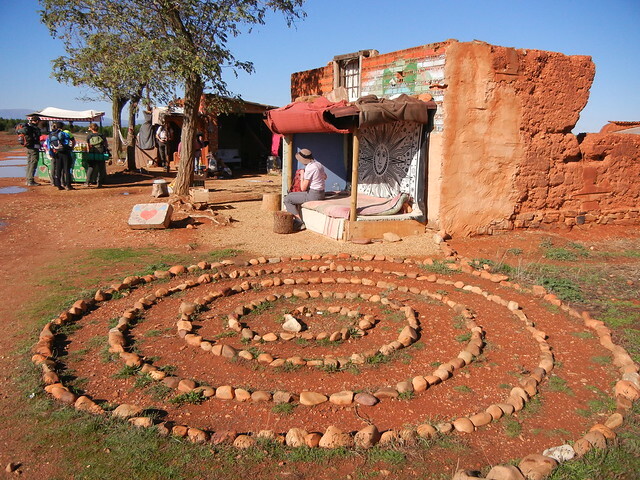 We had made a note to look for “The House of the Gods” after Astorga, something our daughter Tania recommended. We didn’t realize until talking to Suzie that this place and the one Tania told us about were one and the same. Suzie had quite a story to tell about how she came to live here. She got this far on the Camino de Santiago and felt this is where she belongs. She feels no need to complete her pilgrimage by reaching Santiago. Every day is a blank slate and Suzie never knows what will be written on it from one day to the next. She lives completely in the moment with no expectations. Time has slowed down. 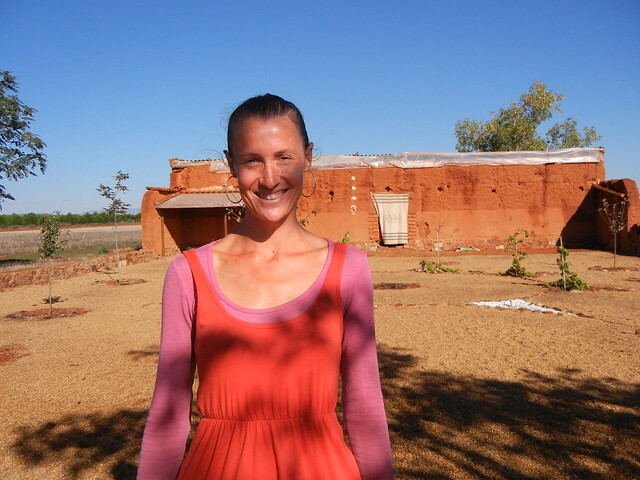 She and her partner, David, have no technology, just two cats, three chickens and this little place. 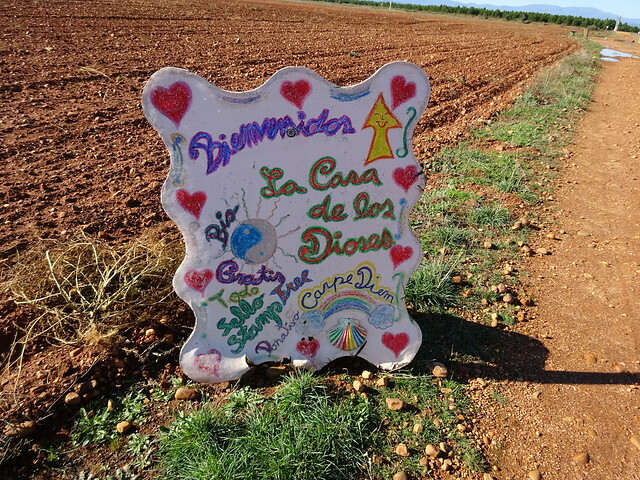 They keep busy doing such things as getting their water 1.5 km away, cleaning up the Camino, and working on their project of expanding their chicken pen to accommodate more chickens. Now back to the beginning of our day. We accidentally took the wrong route when we left Hospital de Orbigo and ended up walking alongside a busy highway for the first three kilometers. We were then able to veer over towards the peaceful, scenic route via a quiet asphalt road to Santibanez de Valdeiglesia. We stopped at a bar for breakfast and had our cafe con leche, freshly sqeezed orange juice, and muffins while chatting with Rebecca from Washington State, the lady we had dinner with the previous night along with Garry. 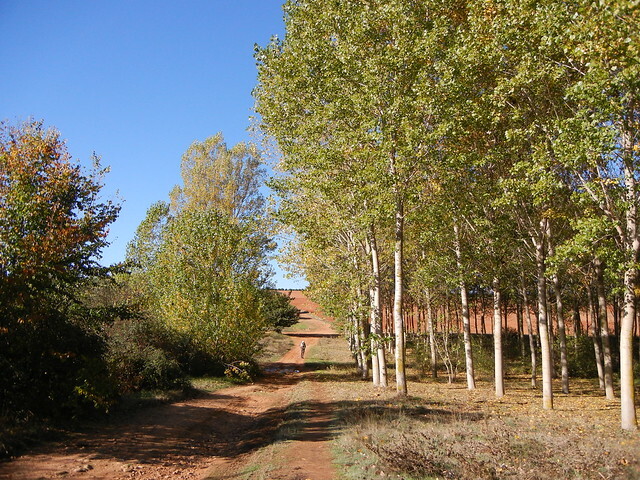 The next 8.0 km was one of the most serene and naturally beautiful paths of the Camino, although the first part was a muddy road under construction. We wound our way through woodland and a wetland area, before climbing out of the gentle valley through scrubland into arable fields. 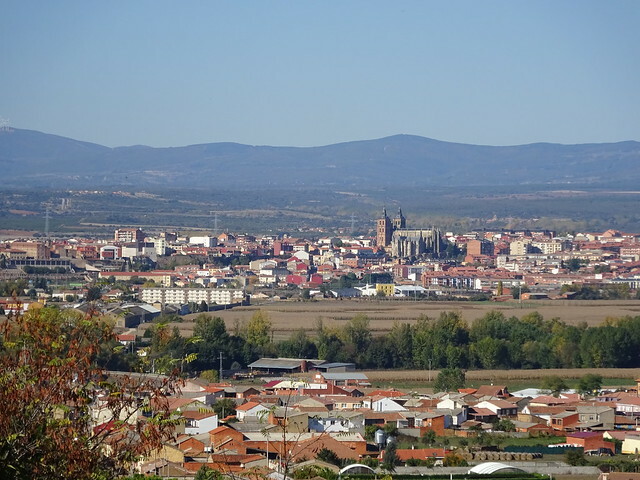 Not far past “The House of the Gods,” we arrived at Monte Gozo where we had an expansive view over Astorga and the Montes de Leon that we would be crossing in the days ahead. An orientation map pin-pointed the location of Cruz de Ferro, the highest part of the whole journey, slightly to the right of the cathedral towers. Cruz de Ferro is a majestic and meaningful place where a simple cross stands. 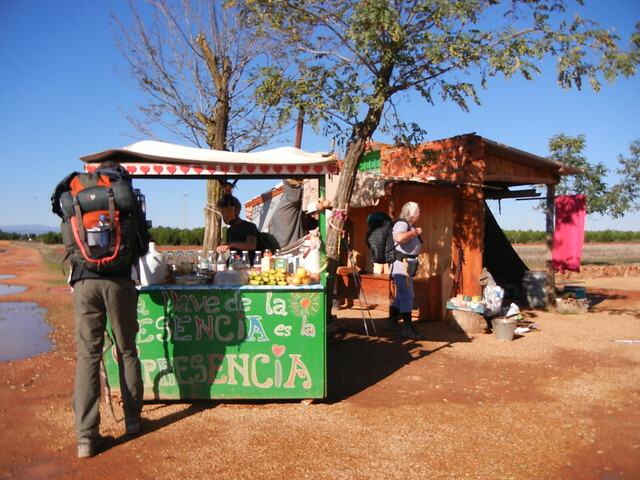 Traditionally this is the place where peregrinos reconnect with the purpose of their journey. They can add a stone or other token to the great pile that is witness to the journeys of all the peregrinos who came before. 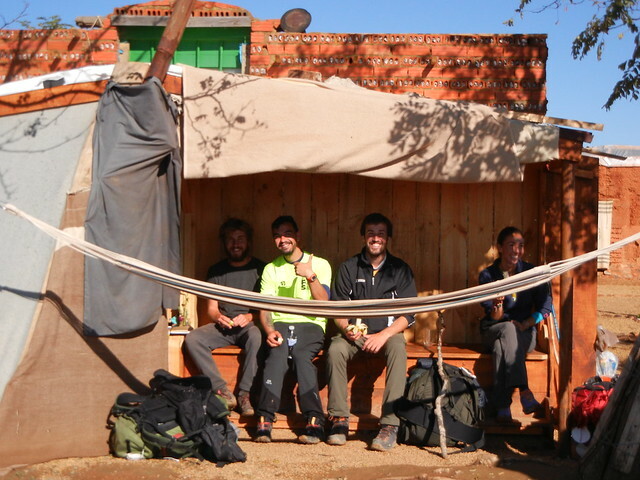 We will be there at Cruz de Ferro in two more walking days. We like Astorga! Astorga is an attractive, clean city set atop a steep ridge with many interesting historic buildings, all tightly packed within its medieval walls. This is where many Camino routes converge. It gave rise to over twenty pilgrim hospitals in medieval times. Just as we arrived, a woman came out of her doorway, chattering away to us in Spanish and holding out a big tray of cherry tomatoes. 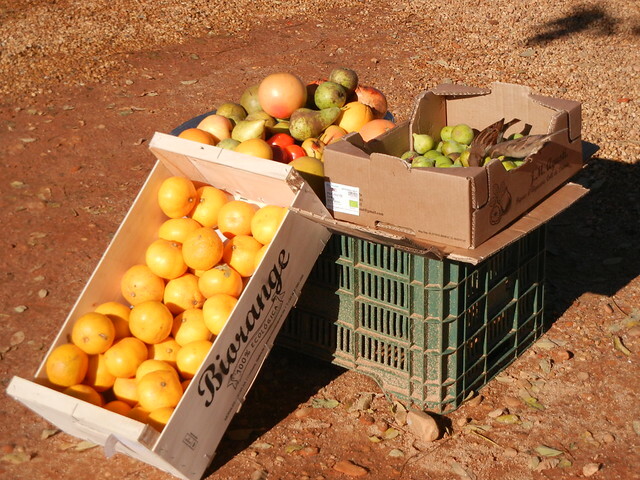 As we were politely taking a small handful each, she disappeared in a flash and returned with a plastic bag and filled it with generous handfuls of tomatoes. Delicious! After getting settled at our “el descanso de Wendy apartamentos” where we had a reservation, we visited some highlights of the city: the cathedral and the attached Museo de los Caminos (the museum of the Ways) and the sensational Gaudi building known as the Palacio Episcopal (Bishop’s Palace). Dave had a little injury, but don’t worry! 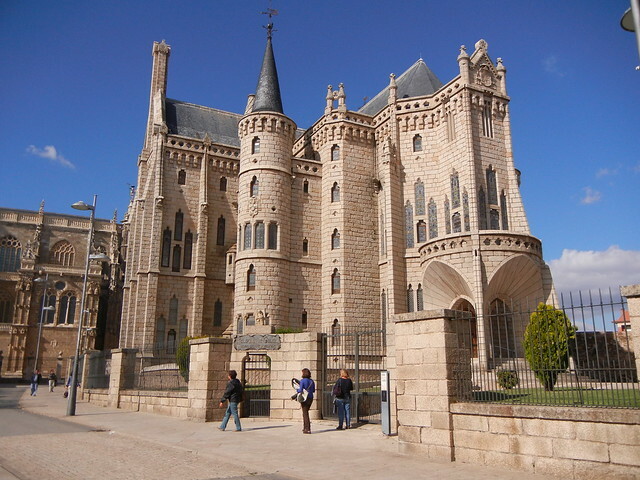 It gave us an excuse to spend one more day here in Astorga in our lovely little apartment. His injury didn’t happen when he was walking but when taking a bath in a little four-foot bathtub in Hospital de Orbigo. He jammed himself into the tub with his knees tucked up in front of his face. When he was getting out of this awkward position, he hurt his knee. Tomorrow will be a better day to walk 21.4 km. 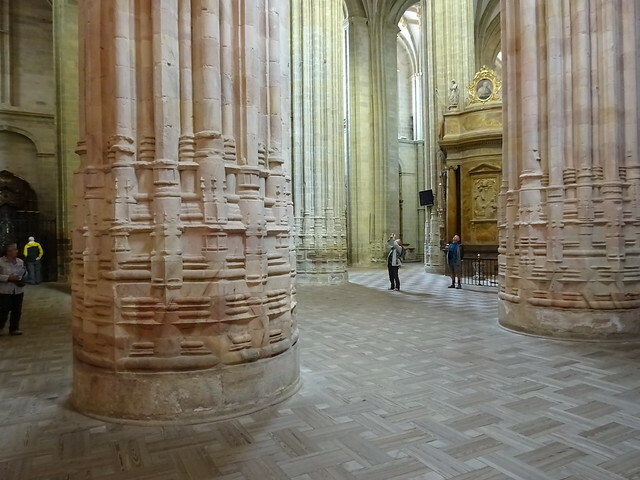 People look the size of ants standing in that cathedral. Hard to imagine how they were built and at what cost to the builders. I am very much enjoying your Videos and Blogs. I am up to Day 41 (watching and read). We also walked the Camino in the Fall of 2015. 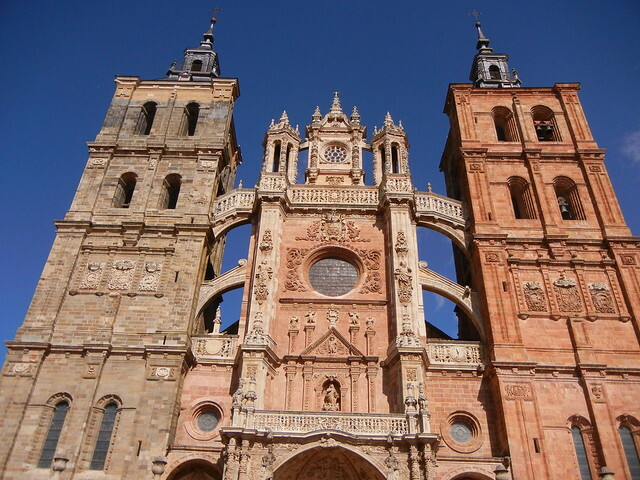 We started a week after you, and past you going into Astorga. And how do I know that…. because I have a picture of you both on the trail. Happy to send it to you. Thank you Randal & Raquel! I’m glad you are enjoying our journey. What a coincidence that you passed us on the Camino in the Fall of 2015. That’s so cool! Sure, we’d love to see the picture of us and one of you also. By the way, did you happen to see a photo of yourselves in any of our videos? It wouldn’t be surprising, because the Camino is famous for its synchronicity. Did you enjoy your jouney too?